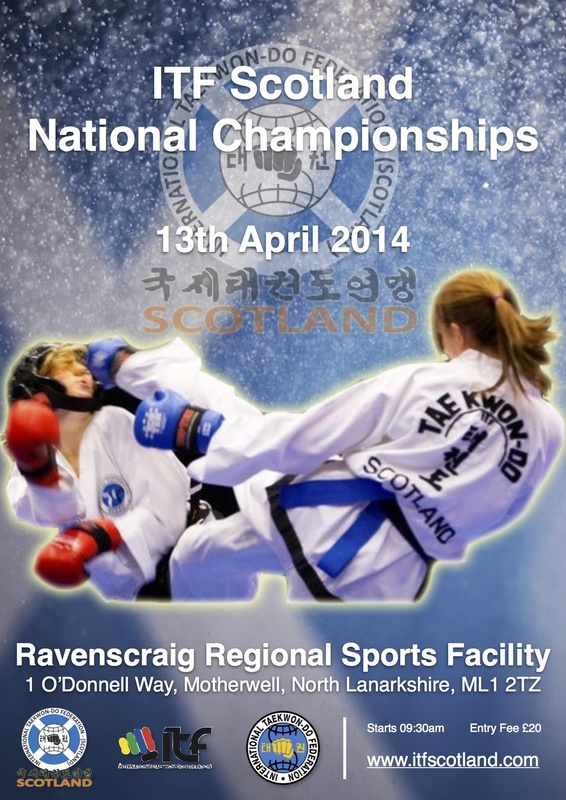 ITF Scotland held their 2014 National Championships on 13th April at the Ravenscraig Regional Sports Facility in Motherwell. 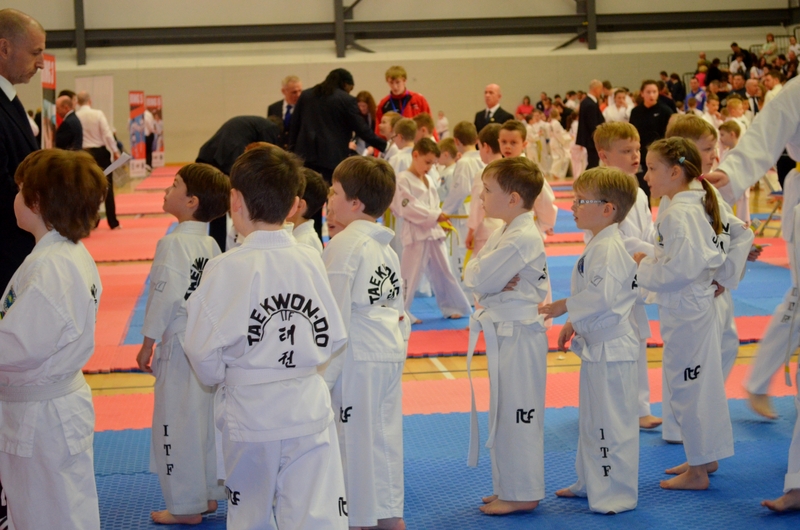 This year there were 455 competitors from 22 schools, including visiting schools from outside of Scotland; NE Sport Taekwon-Do (Wales), Trident Group (England), and TAE (England). The day got under way at 09:30am after a morning umpire’s meeting under the guidance of Master Gordon Wallace 7th Degree, head of the Umpire Committee. Each set of umpire’s were assigned their rings for the day. 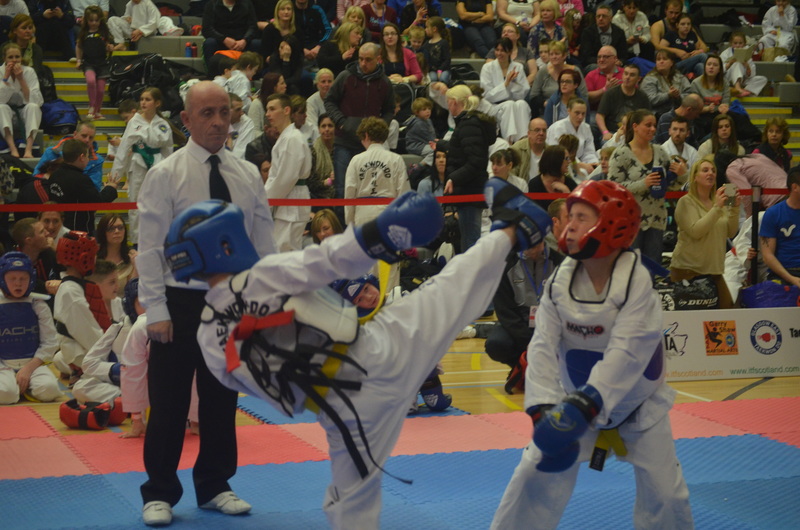 The event started with the youngest students in the following categories; Under 7’s, 8 – 10 years and 11 – 13 years competing in Patterns, Sparring and Special Technique. 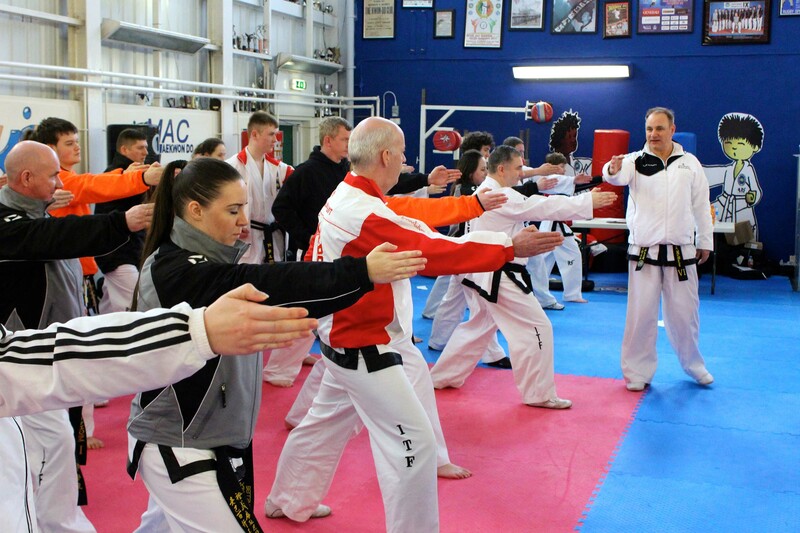 And our over 14 – 17’s, 18 – 35’s and over 36 years age groups starting with Power and Special Technique, before their Patterns and Sparring in the afternoon. 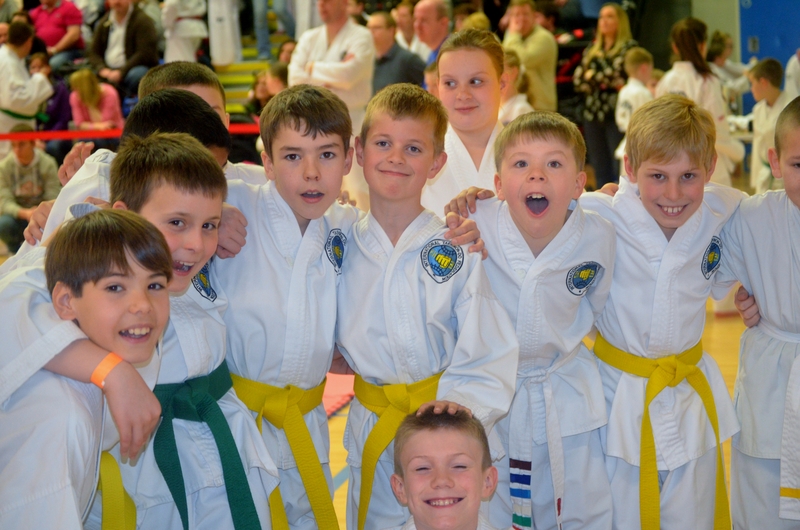 This year’s tournament saw new rules come in to place for Pattern competition with all Males and Female’s being in separate divisions for their Patterns as well and the other events. 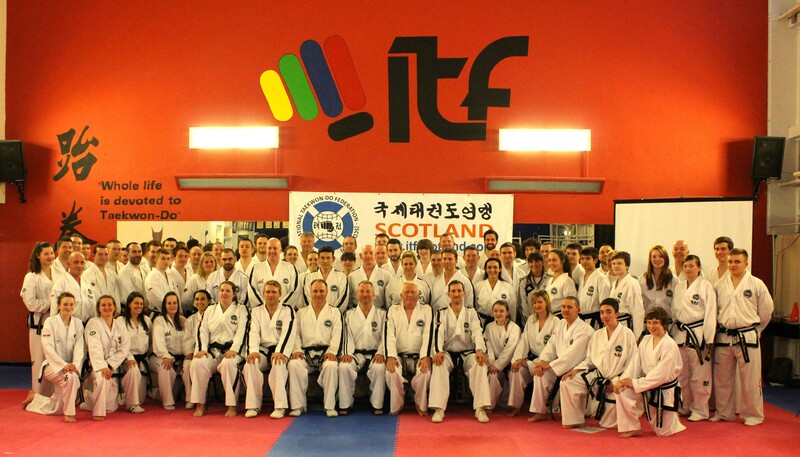 This proved to be very successful move forward for ITF Scotland. We would like to thank everyone for their efforts throughout the day, the competitors showed great sportsmanships during the competition, to the umpire’s for giving up their day to referee, and to the supporters for creating such a great and friendly atmosphere. Results can be found below and full pictures are available via our Facebook page. ITF Scotland have secured a sponsorship deal with Mightyfist to supply doboks to all ITFS national team members for the coming campaign. All ITFS national team members will wear Mightyfist ITF approved doboks at the upcoming European Championships in Italy. 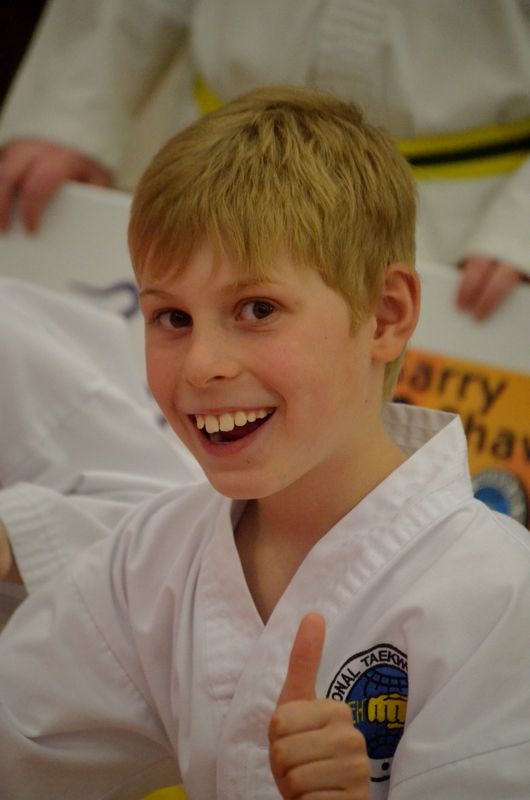 ITF Scotland would like to thank Mightyfist for their sponsorship of our athletes. With regards to the National Championships this coming Sunday 13th April. 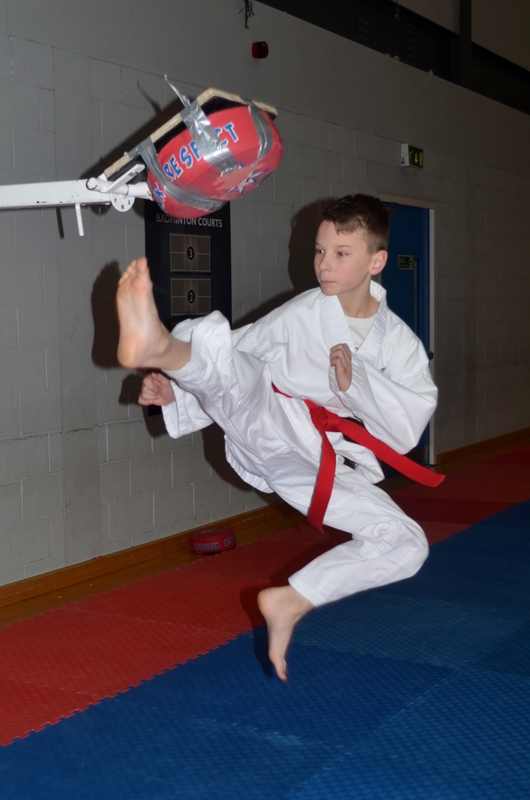 There will be further training for all selected Jury President & Centre Referee’s to held on Saturday 12th April from 1pm – 5pm at GMAC Martial Arts, Livingston, EH54 5LU. Dress code Tracksuit and Dobok. Please also bring a copy of the ITFS Tournament rules. Mr. Garry Shaw VI, Mr. Robin Blair VI, Mr. David Murphy VI, Mr. John McIlvaney V, Mr. Mark Boydell V, Mr. David Lupton V, Mrs. Jackie Timoney V and Mr. Brian McGowan V.
Mr. John McManus IV, Mr. Arthur Doyle IV, Mr. Stewart Walker IV, Mr. Daniel McGhee IV, Mr. Colin Lyon III, Mr. John Munro III, Mrs. Jacqui Wallace III, Mrs. Ngaire Boydell III, Mr. Lee Anderson III, Mr. Gordon Graham III, Mr Michael Leask III, Mr. Steven Lee III, Mr. Brian Anderson II and Mr. Derek Torrens II. 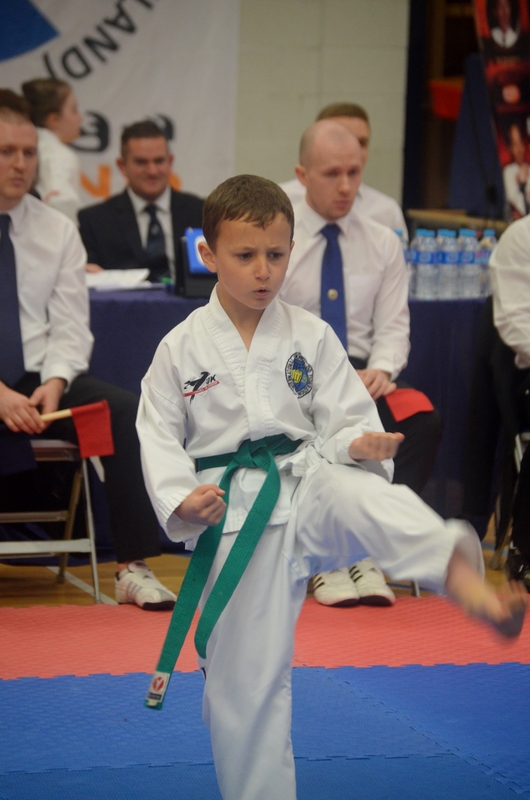 All Black Belts and Umpire’s should attend the competition in official ITF Dress as per Tournament Rules; Navy Jacket and Trousers, long sleeved white shirt, Navy Tie, WHITE GYM SHOES and pen. An umpire meeting for all black belts will take place at the venue at 08:30 am. Please ensure you arrive and register prior to this. 23rd February 2014, Livingston, Scotland. 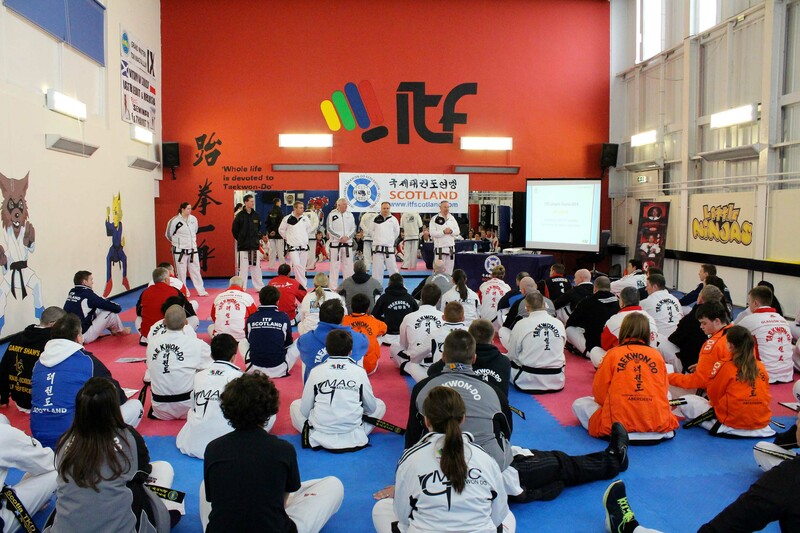 ITF Scotland hosted its first National Umpire Qualification Training, with 67 blackbelt members attending. The course was presented by the ITF Scotland Umpire Committee, Master Gordon Wallace VII, Mr David McNairn VI, Mr Mark Boydell V and Mr David Lupton V. The event was hosted by the ITF Scotland Tournament Committee, Mr & Mrs McIlvaney, at their gym at Livingston. The course lasted from 0900 till 1800 and was the first stage of the national umpire qualification process. The course had been formulated around the launch of the new ITF Scotland Tournament Rules for 2014. The rules encompass a very wide range of competitor ages, grades and physicality, therefore to umpire efficiently and fairly it was important to have a fit for purpose course to present the various codes of practice and procedures for the umpires to follow. The day started with Master Wallace outlining the scope and purpose of the course, along with the mission statement of intent from the Tournament and Umpire Committees to continuous development of our Umpires, and from the networking that followed so many blackbelts did not come forward to umpire of a lack of self-confidence I this area. The course in our opinion had bridged that gap and encompassed an untapped reserve of degree members who never have, or have passed the age of where they can compete at a national tournament, but can have an enormous contribution to the development of our younger members and athletes by becoming a national umpire. Master Wallace continued with the extreme importance of the wider practical duties of umpires who may not be seated in a scoring role but without their input, in keeping pro-active with preparing the readiness of the following matches and divisions, the competition schedule falls behind and the overall tournament dynamic suffers and quite possibly a visitors perspective of the event. Master Wallace extended about the importance of the umpire’s image and how we present ourselves as an organisation to visitors and spectators. The opening section was essentially described as “Do” for Umpires. Master Wallace closed his session with the technical section of Pattern rules and the deduction point scoring techniques that is now applied to the performance assessment. The section looked closely at the methods of comparing competitor performance and scoring a pattern performed by a varied level competitors taking into account age, experience and physicality. The section closed with everyone being involved in small group practical scoring exercises. The second session of sparring was conducted by Mr David McNairn VI and Mr David Lupton V. The applied rules and divisions were explained, but as with all sparring sections of an umpire course, experienced and novice blackbelts alike have issues determining right from left when initiating two different warnings to two competitors! Much fun allowed many lessons to be learned and most importantly with a lot of people now thinking that they would like to be centre referees as it is seen as a challenge to overcome. A very good question and answer session followed before the groups split of to try and test our novice centre referees in training. Mr McNairn and Mr Lupton further discussed what constitutes a valid point from a technical standpoint and also what constitutes a point when infractions to the rules are involved. This again prompted a good question and answer session. The last section of the day was for power and special technique and was conducted by Mr Mark Boydell. In order to raise the profile of power breaking within our national tournament, a new format has been introduced which involved Pre-Qualifying and Medal Rounds. Clarification of the rules, procedures and umpire commands for both power and special technique were discussed and again a good question and answer session followed. The course closed with Mr McNairn extending his passion for the National Flags of Scotland and how they should be hung correctly as banners on walls or suspended over railings at championships as he is extremely dismayed that in many occasions it is back to front. The delegation left the course after all the official photographs were taken, full of knowledge about umpire rules and national flag hanging procedures. The 2014 ITF Scotland National Championships will take place at The Ravenscraig Regional Sports Facility, Motherwell on Sunday 13th April. 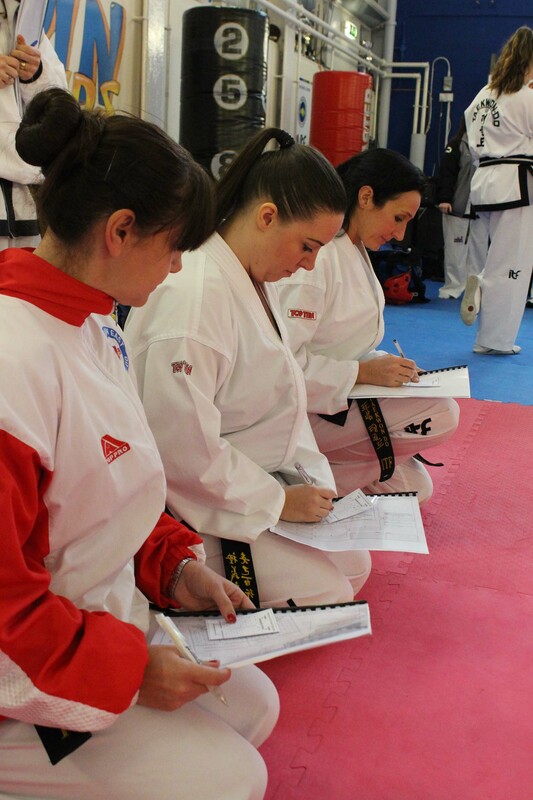 The competition is open to all ITF Taekwon-Do students from 10th Kup to 6th Degree. This year ITF Scotland have introduced a new format to competitions, with changes to the age spread. the competition will be split into the following age categories; 7 years & under, 8 – 10 years, 11 – 13 years, 14 – 17 years, 18 – 35 years and over 36 years. As always these will be further split into Beginner (white/yellow belt), Intermediate (green/blue belt) and Advanced (red/black belt). Application Forms can be found below – closing date for all applications is 1st April. 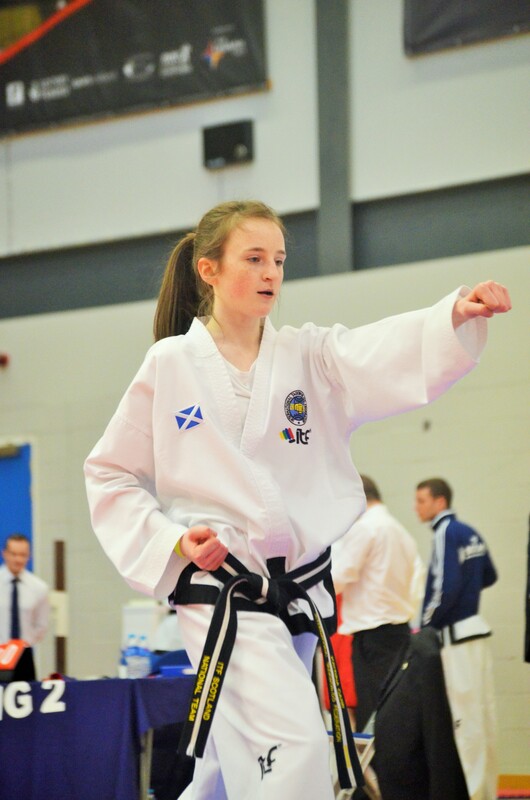 ITF Scotland National Squad Training will not be on this weekend due to the ITF Scotland Umpire Course this Sunday however it will continue the following, Sunday 2nd March at the Gmac Dojang, Livingston as per the details on the Facebook page. 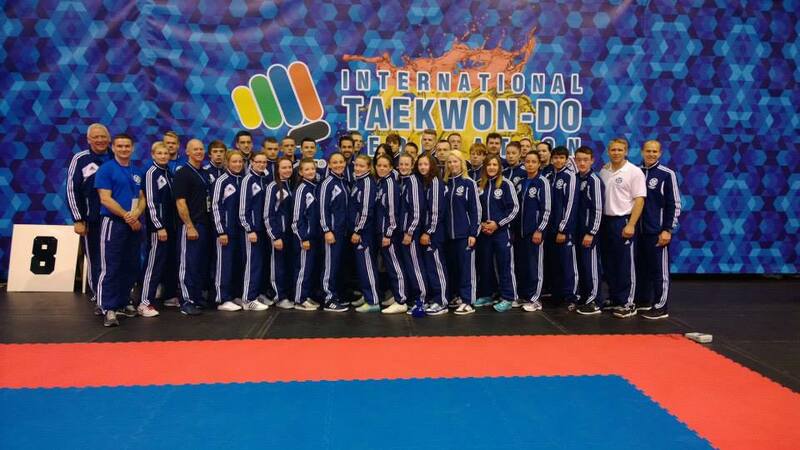 Full training dates and times posted on the Scotland TKD Team Facebook page. 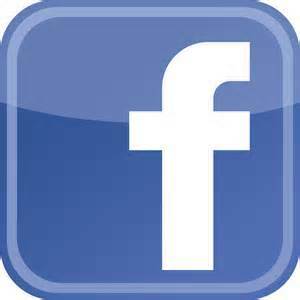 Keep up to date with the all the ITF Scotland Team news, up and coming European Championships and National events via the the Facebook page.